These mini clips, also known as nut & bolt clips, are ideal for small bore hoses with relatively low pressures, where little clamping force is required. Used in low pressure applications such as a fuel line. Jubilee® Juniors are available in mild steel zinc plated and marine grade 304 stainless steel. Two assortment packs are available containing either 54 (PPJJ) or 165 (JA165) Jubilee Junior clips in mild steel or 304 stainless steel. Diameter These represent minimum recommended diameters according to the relevant standard. 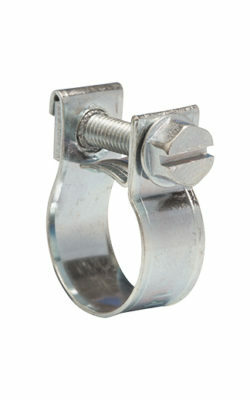 The fully threaded band of Jubilee® worm drive clips allows a wider adjustment range than this where necessary. Max.Maximum pressure All technical data is for comparison purposes only. There are many variables in each application, such as hose, ferrule and medium, which make it impossible to provide data that is universally accurate. If you have a specific application please contact us directly for technical assistance.